The sport’s big Wembley outing is upon us, but that’s only the beginning of what’s going on in the world of Rugby League this week. Here’s what you’re going to find inside. •	There’s a huge salary cap row set to be addressed this week. It revolves around Catalans. 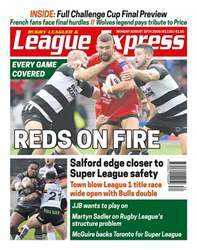 •	Staying on Catalans, we have extensive preview coverage of their massive Challenge Cup Final showdown, plus a piece with Warrington favourite Adrian Morley and Garry Schofield analyses both sides’ chances. 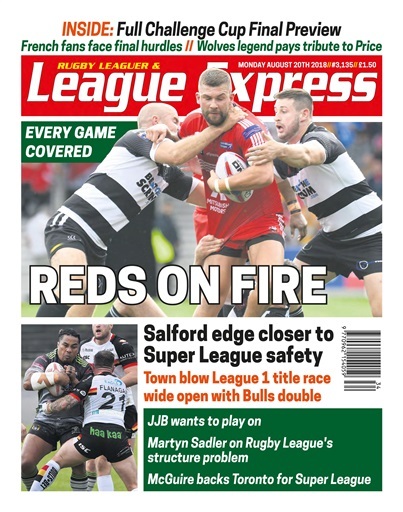 •	One League 1 chairman calls for Super League to become a 14-team comp… days ahead of another structure meeting. •	Our editor Martyn Sadler puts forward his own proposal for a structure that could break the negotiation deadlock. •	Jackson Hastings gives his biggest hint yet on his Salford future. •	Big retention news from Huddersfield. •	Confirmation of one Castleford player leaving the club at the end of the season, and his destination. •	We reveal which Super League club will be running a reserve grade in 2019. •	Danny McGuire has his say on Hull KR’s experience in Toronto. •	Tommy Makinson spoke to us about England. •	Kris Radlinski discusses Wigan’s stance on recruiting from the Championship.